A phreatic eruption, also called a phreatic explosion, ultravulcanian eruption or steam-blast eruption, occurs when magma heats ground or surface water. The extreme temperature of the magma (anywhere from 500 to 1,170 °C (932 to 2,138 °F)) causes near-instantaneous evaporation to steam, resulting in an explosion of steam, water, ash, rock, and volcanic bombs. At Mount St. Helens, hundreds of steam explosions preceded a 1980 plinian eruption of the volcano. A less intense geothermal event may result in a mud volcano. Phreatic eruptions typically include steam and rock fragments; the inclusion of liquid lava is unusual. The temperature of the fragments can range from cold to incandescent. 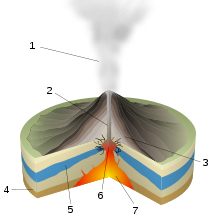 If molten magma is included, it is classified as a phreatomagmatic eruption. These eruptions occasionally create broad, low-relief craters called maars. Phreatic explosions can be accompanied by carbon dioxide or hydrogen sulfide gas emissions. The former can asphyxiate at sufficient concentration; the latter is a broad spectrum poison. A 1979 phreatic eruption on the island of Java killed 140 people, most of whom were overcome by poisonous gases. Phreatic eruptions are classed as volcanic eruptions because a phreatic eruption could bring juvenile material to the surface. It is believed that the 1883 eruption of Krakatoa, which obliterated most of the volcanic island and created the loudest sound in recorded history, was a phreatic event. Kilauea, in Hawaii, has a long record of phreatic explosions; a 1924 phreatic eruption hurled rocks estimated at eight tons up to a distance of one kilometer. Additional examples are the 1963–65 eruption of Surtsey, the 1965 eruption of Taal Volcano, the 1982 Mount Tarumae eruption, the 2014 eruption of Mount Ontake and on May 7, 2013, at 8 a.m. (PST) Mayon Volcano produced a surprise phreatic eruption lasting 73 seconds. ^ Mullineaux, D.R. et al. (1987) Volcanic Hazards in the Hawaiian Islands in Volcanism in Hawaii, volume 1, USGS Professional Paper 1350, page 602. ^ a b "VHP Photo Glossary: Phreatic eruption". Volcano Hazards Program. U.S. Geological Survey. Retrieved 13 November 2010. ^ "On February 20th, 1979, 142 inhabitants of Dieng Plateau (Indonesia) were asphyxiated by poisonous gases during a mild phreatic eruption. From later fields gas collection and analysis, the casualties are considered to be due to CO2 rich volcanic gases." F. Le Guern, H. Tazieff and R. Faivre Pierret, "An example of health hazard: People killed by gas during a phreatic eruption: Diëng plateau (Java, Indonesia), February 20th 1979", Bulletin of Volcanology 45 (1982): 153–156. ^ "A precursory phreatic or phreatomagmatic stage has been identified in the 1883 Krakatau eruption (Simkin and Fiske, 1983)". A precursory phreatic or phreatomagmatic stage has been identified in the 1883 Krakatau eruption (Simkin and Fiske, 1983). David J. W. Piper, Georgia Pe-Piper and Darren Lefort, "Precursory activity of the 161 ka Kos Plateau Tuff eruption, Aegean Sea (Greece)", Bulletin of Volcanology 72 (2010): 657–669. ^ Simkin T, Fiske RS (1983) Krakatau 1883: The Volcanic Eruption and its Effects. Smithsonian Institution Press, Washington. ^ "On May 10, 1924, a violent phreatic (steam) eruption began in Halema'uma'u that sent repeated columns of ash high into the sky. The explosions continued for 18 days, with the largest occurring on May 18. The steam explosions hurled rocks as large as eight tons as far as 0.6 miles from the crater; these blocks still surround Halema'uma'u. One of these blocks fatally injured a Mr. Taylor, who approached too close to the crater to take a photograph." Phreatic Eruptions, Hawaiian Volcano Observatory, US Geological Survey, 6 May 1994.